As could be expected (see post from March 23rd, 2013) a ‘guidance’ issued by the Financial Crimes Enforcement Network (FinCEN) in 2015 was used as pretense to fine a cryptocurrency project. Unwilling participant Ripple Labs and its subsidiary XRP II was fined $700,000 for “willful violations” of the Bank Secrecy Act (BSA). According to FinCEN’s press release, Ripple failed to register as a money services business (MSB) with FinCEN before selling XRP for fiat currency. XRP is a virtual currency (a term invented and (newly) defined by FinCEN!) which used to settle payments on the Ripple blockchain. Additionally, the Ripple was accused of having failed to implement appropriate anti-money laundering (AML) procedures concurrent with its responsibilities as an MSB. Notably, the settlement agreement between Ripple Labs, its subsidiary and FinCEN took place at the same time as a settlement between the companies and the US Attorney’s Office in the Northern District of California. The Internal Revenue Service’s Criminal Investigation Division also contributed to the investigation. Ripple and XRP II agreed to pay $450,000 and settle “possible criminal charges” in connection with that investigation, with those funds being credited to the fine imposed by FinCEN. Take-away for the sale of virtual currencies is to not accept fiat in exchange for a virtual currency unless the company has a money transmitter license. — However, reading FinCEN’s Guidance Paper on the subject of “Application of FinCEN’s Regulations to Persons Administering, Exchanging, or Using Virtual Currencies” it can be expected that any issuer of a virtual currency is to be considered a Money Services Business. 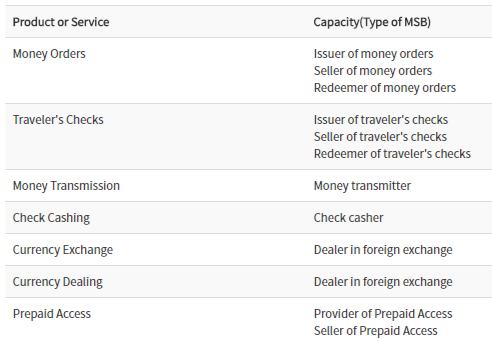 CA MBS: The Money Transmitter Division of DBO licenses and regulates money transmitters, which includes issuers of payment instruments (money orders), travelers checks and stored value. ALSO READ: STATEMENT OF FACTS AND VIOLATIONS.